Urologists diagnose and treat problems involving the male and female urinary tract and the male reproductive organs. To make their task easier, ASHRAF Medical Division has a specialized ‘Urology Division’ which serves the doctors and hospitals in Kuwait. Porges™ is part of Coloplast group. Porges is conceiving, developing, manufacturing and selling worldwide medical disposable devices for the hospital management of urologic and gynecologic disorders such as urinary stone disease, benign prostate hyperplasia, voiding dysfunctions and urinary incontinence (male and female). The device is designed to get a continuous access to the ureter and kidney. It protects the ureter during repeated instrument exchanges during ureteroscopy. Ureteral Stents are used to restore and maintain ureteral drainage from the kidney to the bladder. High pressure ureteral balloon catheters are used during endoscopic procedures. Stone extractors are used for stone extraction during ureteroscopy procedures. Dornier provides the health-care community with leading-edge medical devices used to detect and treat a variety of conditions and diseases. Our advanced design, manufacturing and field service capabilities are providing quality medical solutions and improving the health of the population. Dornier Gemini is a premier multifunctional lithotripter providing an unparalleled platform for both lithotripsy and endourology. 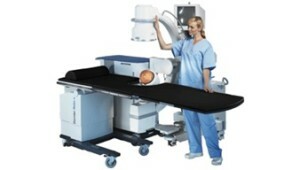 The combination of positioning flexibility, open access and large imaging areas create an optimal platform.